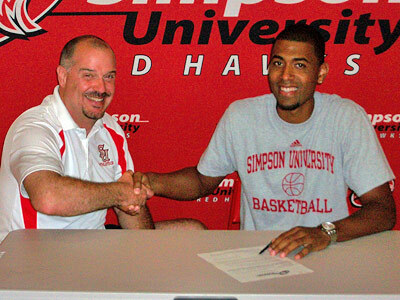 REDDING, Calif. – Simpson University men's head basketball coach Matt Thacker announced today that Justin Phillips of Tracy signed a letter of intent to play for the Red Hawks during the 2011-2012 academic year. The 6-foot-four point guard will join the Simpson Red Hawks after playing for two years at San Joaquin Delta College where he helped lead his team to the state tournament his freshman year, started every game as a sophomore and made state playoffs. Prior to college basketball, Phillips played three years of varsity at Merrill F. West High School under the direction of Coach Rich Ressa where he earned honorable mention, second team all-San Joaquin section and second all-time in total points. He also broke the West High School single game points record with 33 points his senior year. "Justin came to us highly regarded from his coach at Delta College as both a player and person," said Coach Thacker. "I will look to him to give us added length and depth in our backcourt. He is a good athlete with the ability to knock down jump shots and guard all four positions. Justin is a good student with a strong character." Phillips said that Simpson appealed to him for a couple of reasons. "I chose Simpson because I wanted to attend a Christian university with a great psychology program," said Phillips. "Another influencing factor was Coach Thacker. When I visited the campus he made me feel welcome and at home. It will be an honor to play under his direction." Phillips will enroll in Simpson's psychology program in the fall.